What is the Generic name of Althrocin? 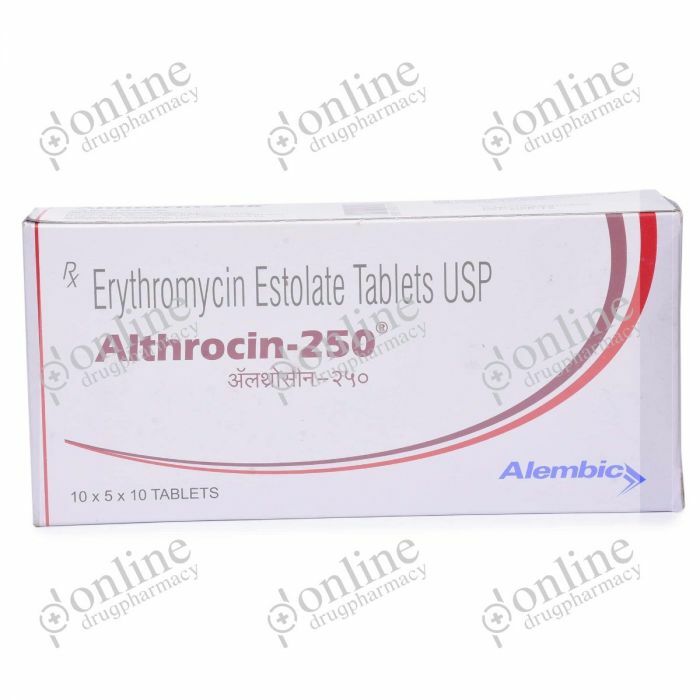 Erythromycin is the generic name of Althrocin 250 mg.
Althrocin is commercially produced by Alembic Pharmaceuticals, India and it is available at all the leading online pharmacies, drug stores, medical stores and hospitals. It is one of the leading pharmaceutical companies in India. Althrocin contains the active ingredient erythromycin. It should be noted that Althrocin 250 mg is available in various strengths. One should use the strength as directed by the physician. It is available in strengths of 125mg, 250mg,500mg. How Althrocin 250mg (Erythromycin) works? Althrocin mainly consists of erythromycin which is a macrolide antibiotic. It is a bacteriostatic drug that is it inhibits the multiplication of the bacteria by interfering with its protein synthesis. Thereby it is used in infections caused by bacteria. • You are not allergic to it. • It is not interfering with other medications. • It is not affecting the mother and the baby during pregnancy and lactation. • If the patient is taking terfenadine or astemizole. • You are taking any other medication for any other disease or disorder. • You are pregnant or breastfeeding. • You have medical history especially of kidney problems, liver problems. Althrocin is available in various strengths and as different doses. One should use the strength and dose as directed by the physician. How Much Of Althrocin 250mg (Erythromycin) shall I Use? For adults- the usual dose is 250mg every 6 hours. It is taken 1 hour before meals. For kids- 30-40 mg/kg/day is usually given in divided doses. For how long should I continue using Althrocin 250mg (Erythromycin)? Take this medication regularly. One should continue taking it even if he/she feels well. This medication should be taken exactly as prescribed by the physician. One should not increase the dose or stop this medication without consulting a physician. One should continue the medication as directed by the physician.One should avoid long-term use of erythromycin as it may increase the chances of secondary infections. An overdose of Althrocin may lead to deranged liver functions. In such cases take the patient to the nearby hospital. Long-term use may lead to secondary infections. If one misses a dose, he/she should take it as soon as they remember. If they miss it, they should take the next dose. Do not double the dose. Do not take multiple doses at a time. • Take Althrocin 250mg as and when directed by the physician. • Do not alter the course or stop the drug without consulting the doctor. • Check the expiry date. • Avoid Althrocin 250 mg in liver patients. • Make sure that you are not pregnant and breastfeeding. Althrocin 250mg is available in the form of tablets. These must be taken as directed by the physician. The Dose depends on body weight and severity of the disease. Consult a doctor regarding the drug dose to be taken. For kids- 30-40mg/kg/day is usually given in divided doses.